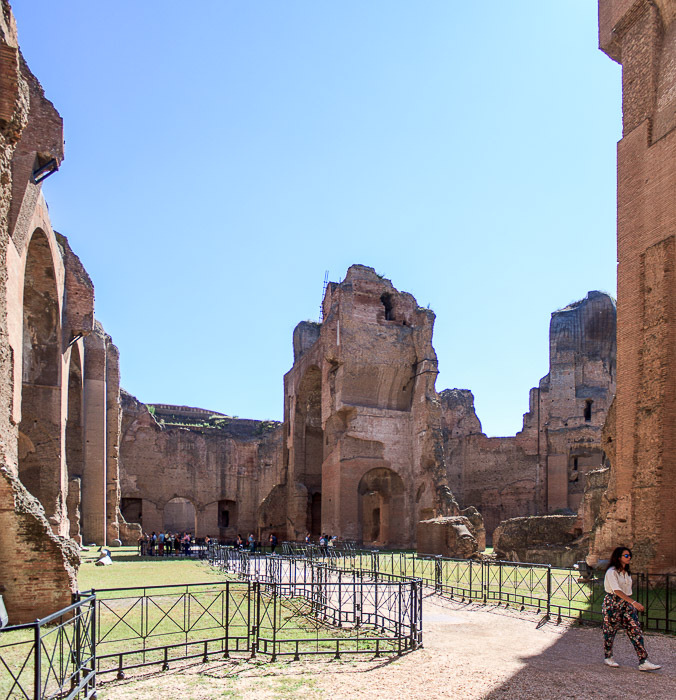 The Baths of Caracalla are a huge bathing complex located about a mile south of the Colosseum, and are among the most monumental and imposing archeological complexes of the entire Imperial epoch. 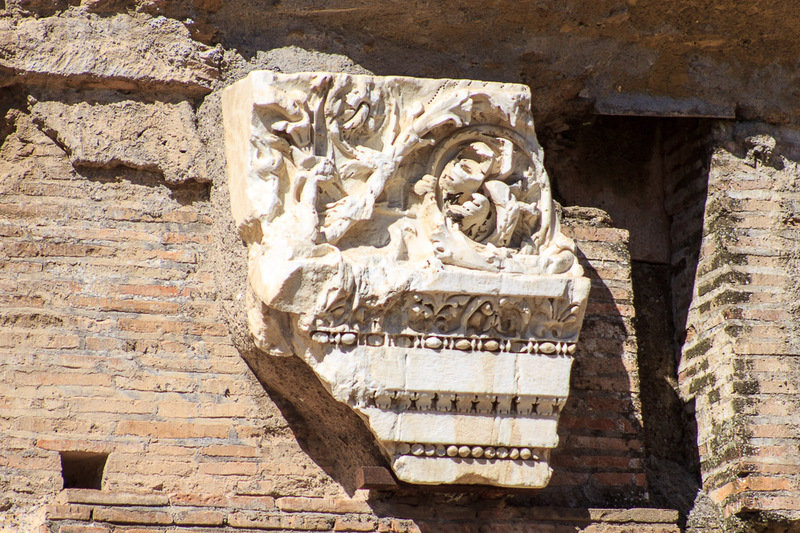 They were begun in 212 AD under Septimius Severus, inaugurated in 216 AD under Caracalla, and were completed in 235 AD under Alexander Severus. 9000 workers were employed daily during the first 5 years, including those that quarried or produced materials and transported them to the site. 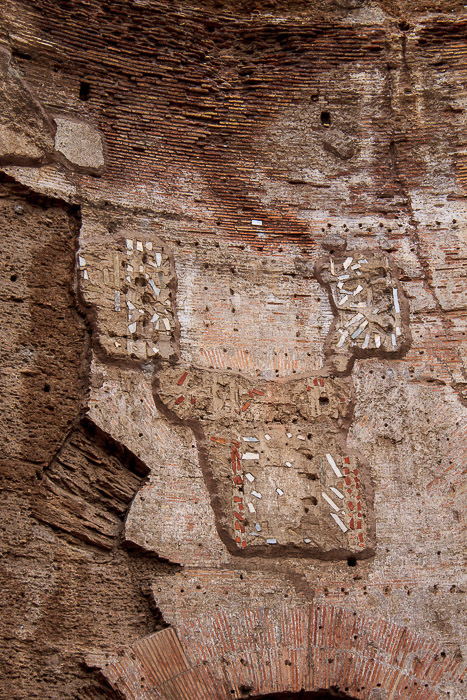 The baths were constructed of several million red bricks, lined on the outside with white stucco to resemble stone, and lined on the inside with sumptuous marble. 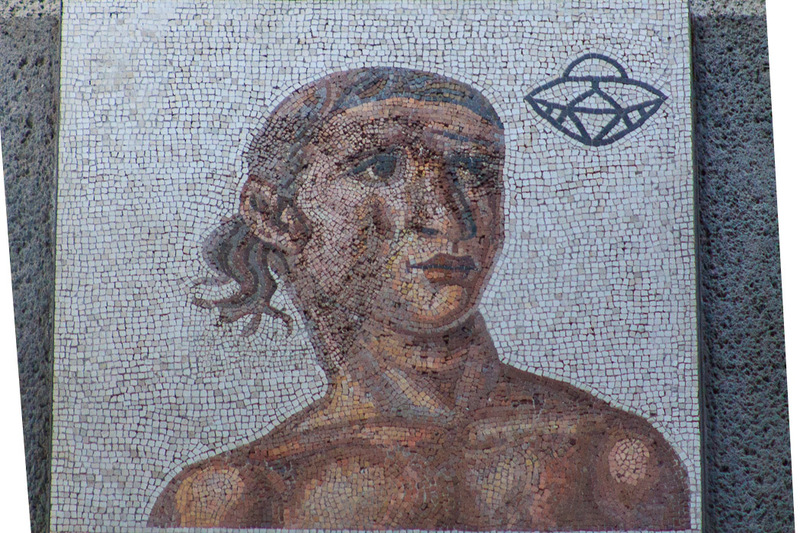 Walls and floors featured vast mosaics, niches in the walls contained sculptures, and free-standing high-quality sculptures ornamented the various rooms. 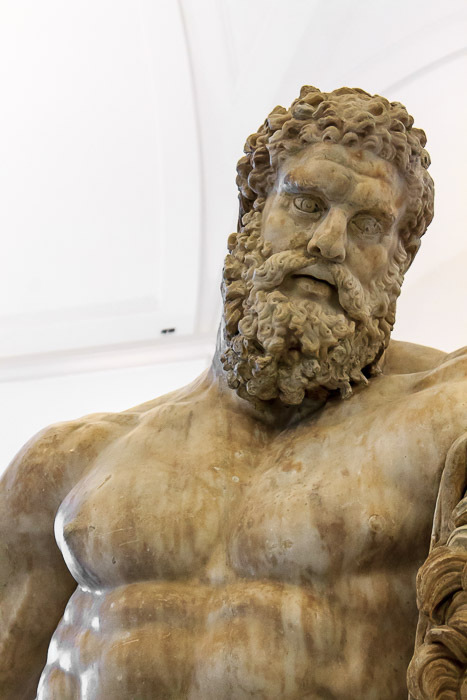 Many of the sculptures were on a very grand scale, for example the famous larger-than-life Hercules which was found in the baths in the 16th Century stands 10 feet 6 inches tall. The ceilings were huge frescoed vaults. 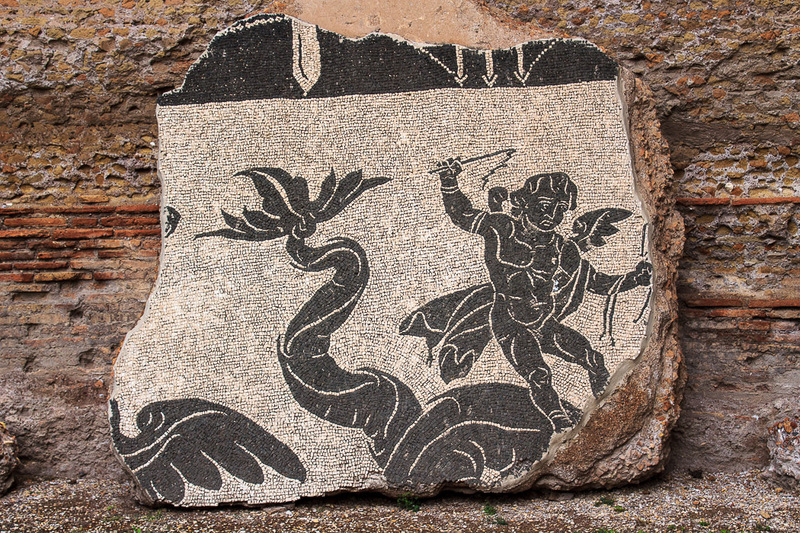 A branch of the Aqua Marcia named the Aqua Antoninianus was constructed to supply water to the baths. 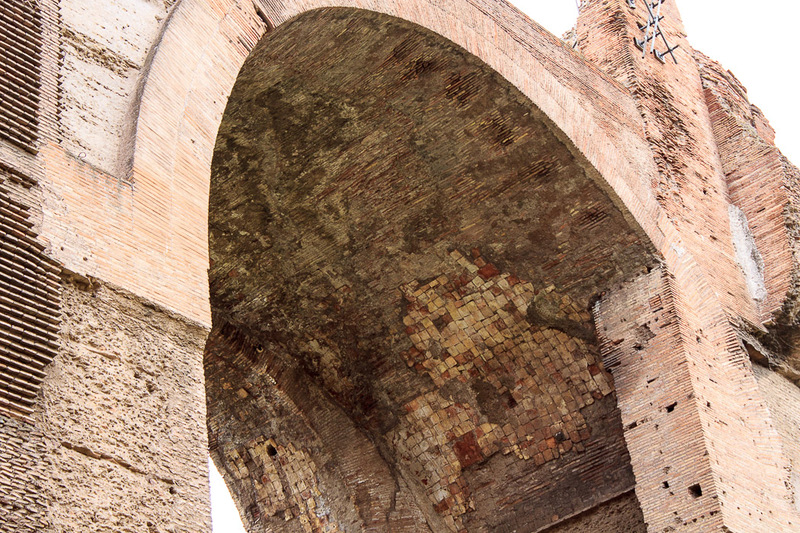 One remaining vestige of the Aqua Antoninianus is the Arch of Drusus, which carried the aqueduct over the Appian Way. 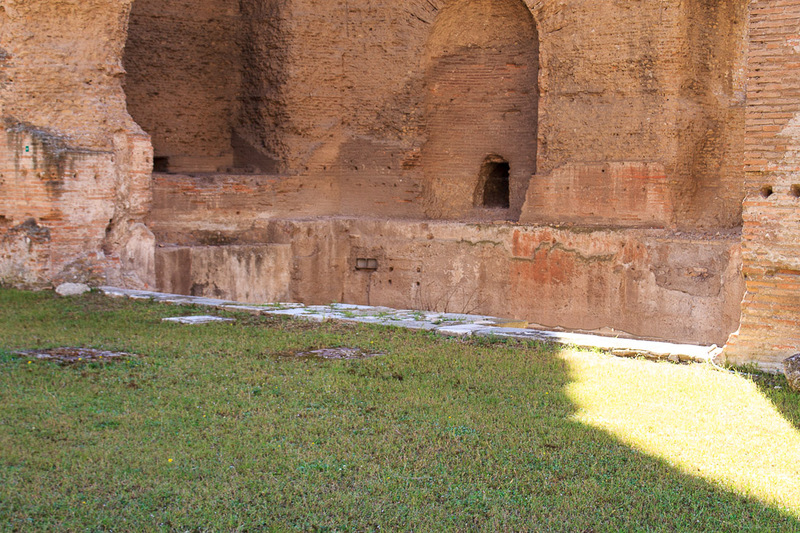 At a time when Rome's crowded tenements had few sanitary facilities, the more than fifty public baths in Imperial Rome played an important part in Roman society, though only a few were on this huge scale. 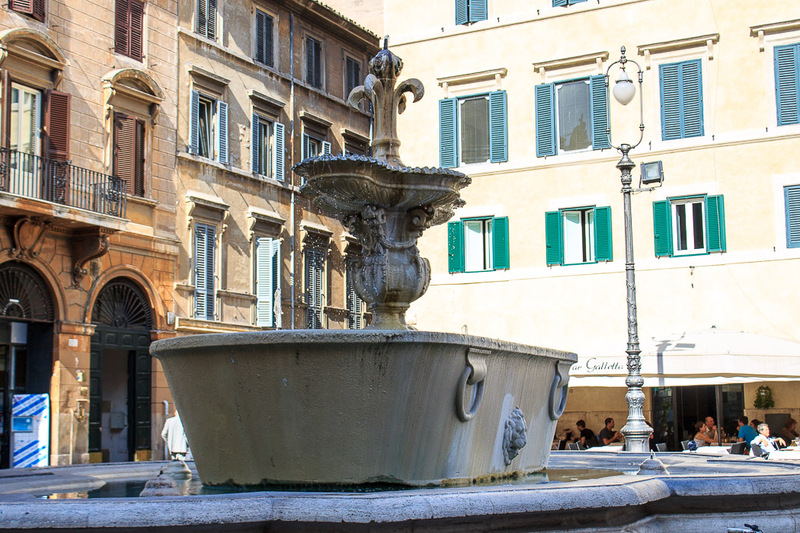 Not only did they improve the cleanliness and health of Rome's citizens, but the baths were also places where Romans came to socialize, gossip and relax. 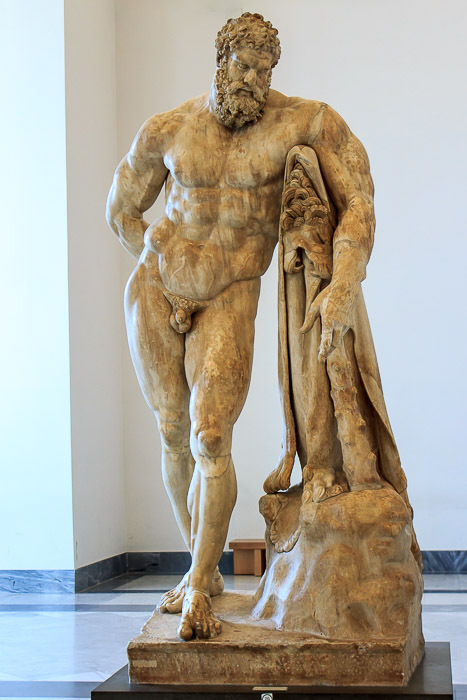 Admission to the Baths of Caracalla was free. 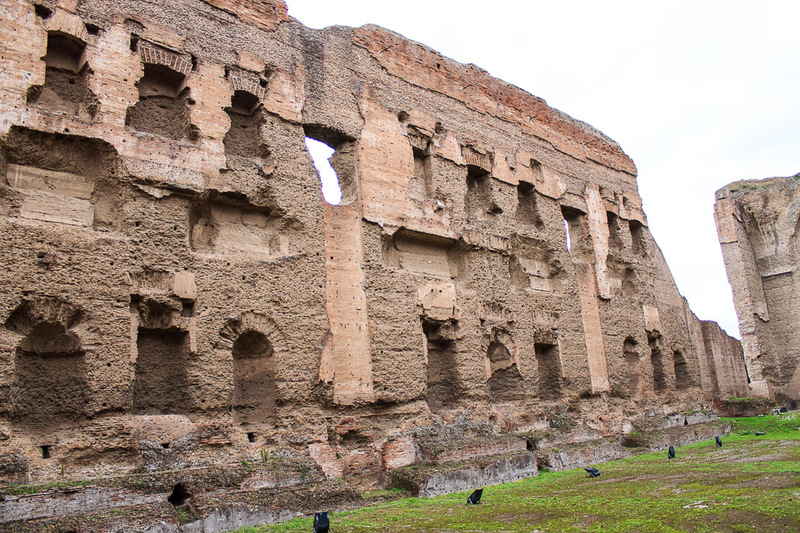 A public relations coup, the free baths, pleasurable experience and lavish surroundings were all intended to make the people think favorably of Caracalla. 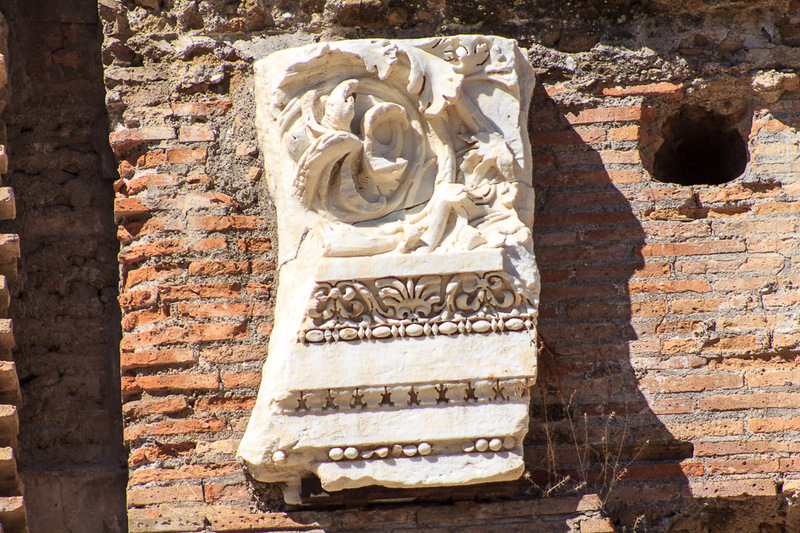 See all Baths of Caracalla photos. 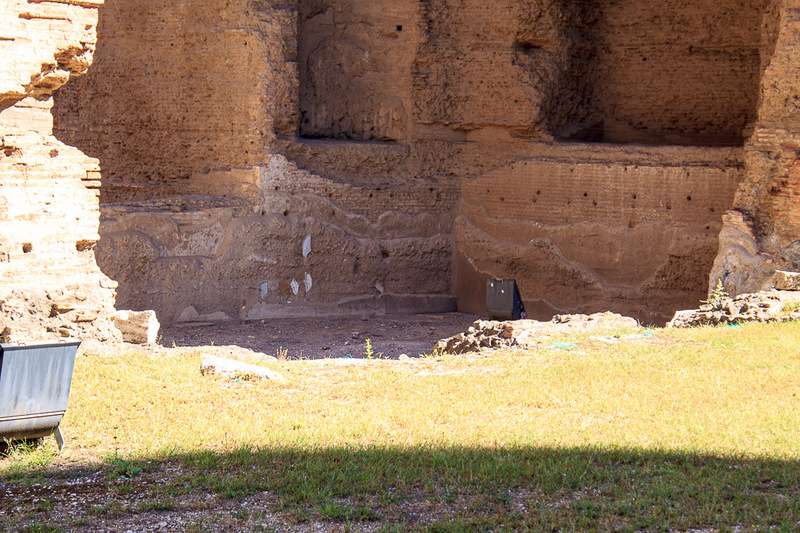 At the Baths of Caracalla, the ritual of bathing was a long process. 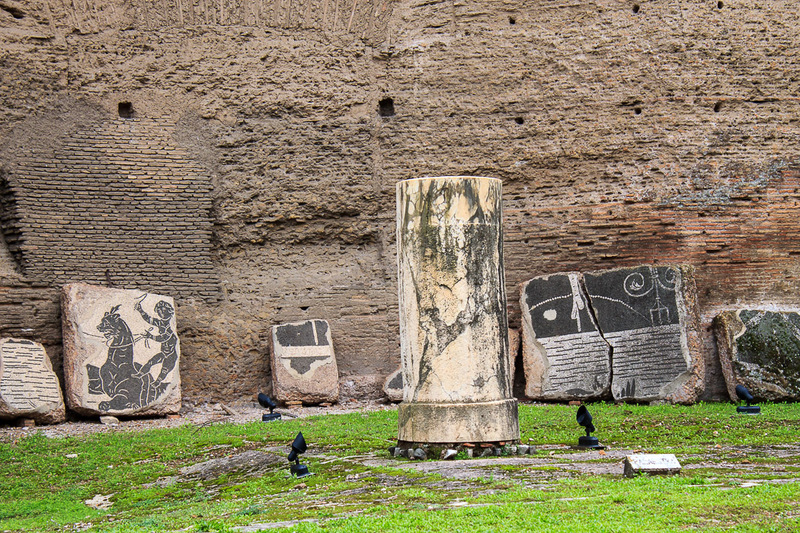 Refer to the diagram in the 1st photo below for the rooms of the Baths of Caracalla. The first stop would be the spogliatoi (2nd photo below, the unlabelled room below the right-side room f) or apodyterium (3rd photo below, the right side room e), a changing room, to change from your street clothes into your workout or bath clothes. These rooms were not particularly large compared with what is to come. The 3rd photo below makes the apodyterium look larger than it really is because it's a 180-degree view; really the room is perhaps 40 or 50 feet square. 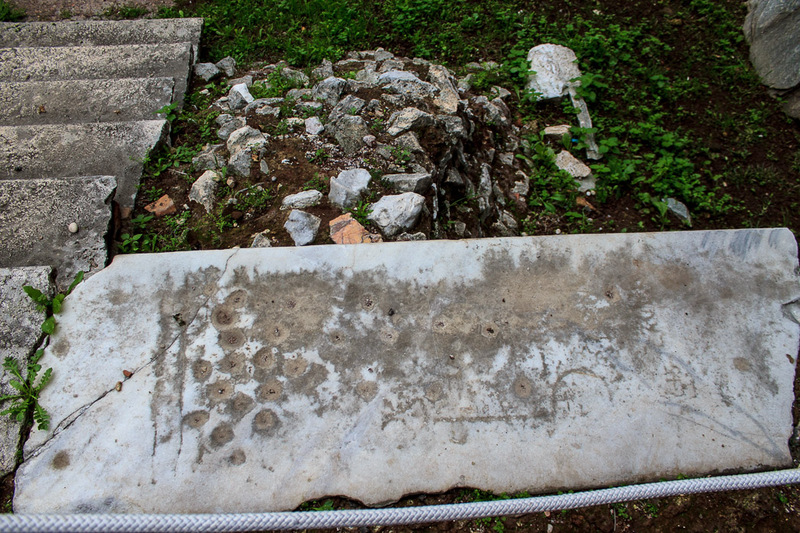 The floor in the apodyterium is well-preserved, and shown in detail in the 4th photo below. From the changing room you might go to the palaestra (1st and 2nd photo below), which was a gym or exercise room, where you'd perform light exercise if you had the time and the inclination. This is a huge space, look at the size of the people in the 1st and 2nd photos below for scale. Notice the holes in the rear wall which were used to support a second floor which collapsed long ago. 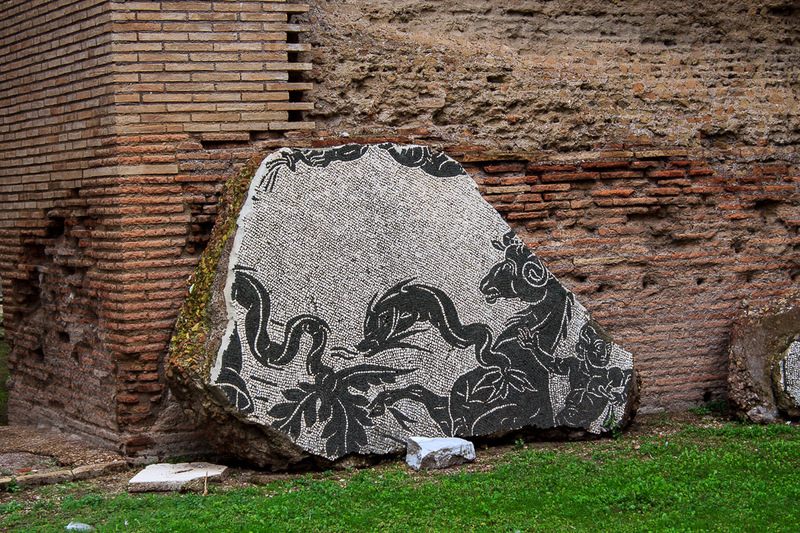 The 3rd photo shows a mosaic floor from the western Palaestra. Then it was on to the actual bathing, which would begin in the caldarium, or hot bath, which was 115 feet in diameter, where people would wash themselves. 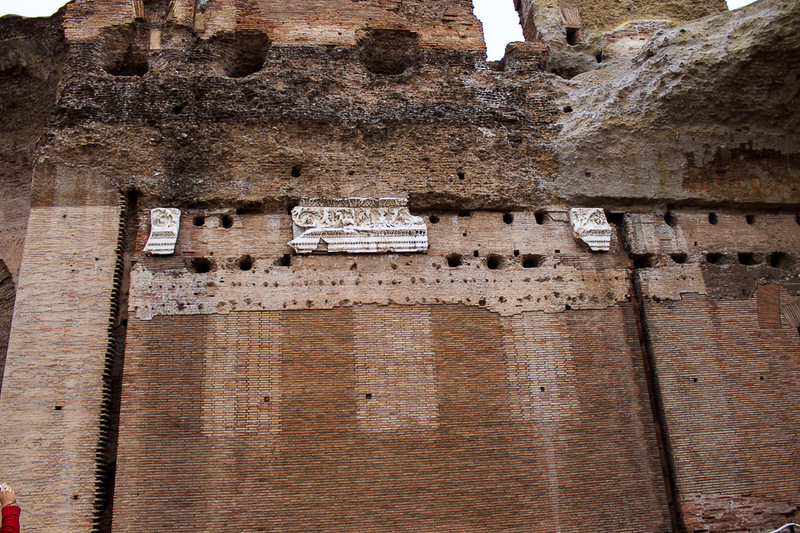 Not much is left of the caldarium in the Baths of Caracalla, shown in the 1st photo below, and from outside the building in the 2nd photo below. Underneath the caldarium in the underground level was the entire heating system, including the cauldrons (boilers) for heating water. The furnaces burned an average of ten tons of wood each day. The caldarium was a round room with marble floors covered by a dome of 36-meters diameter, only slightly smaller than the Pantheon. 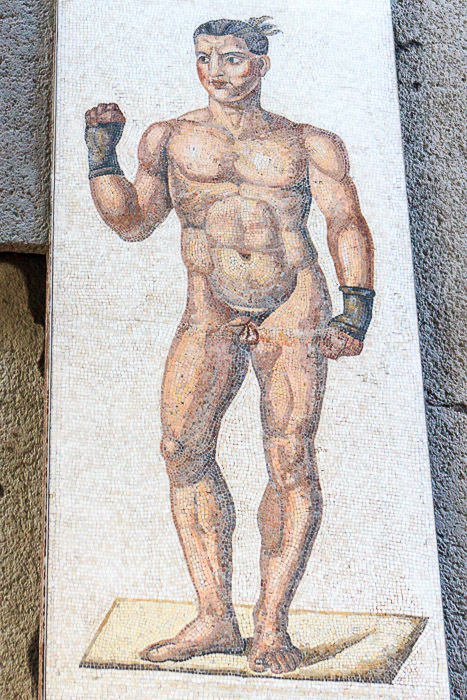 Next up was the lukewarm double-pool tepidarium (I don't have a photo of that), or perhaps a visit to the laconica (saunas) on either side of the caldarium. After the hot and warm baths you would go to the cold frigidarium (1nd through 7th photos below), a massive 183 by 79 feet (that's 2/3 of a football field) under three groin vaults 108 feet high that rested on eight colossal columns made of grey Egyptian granite. 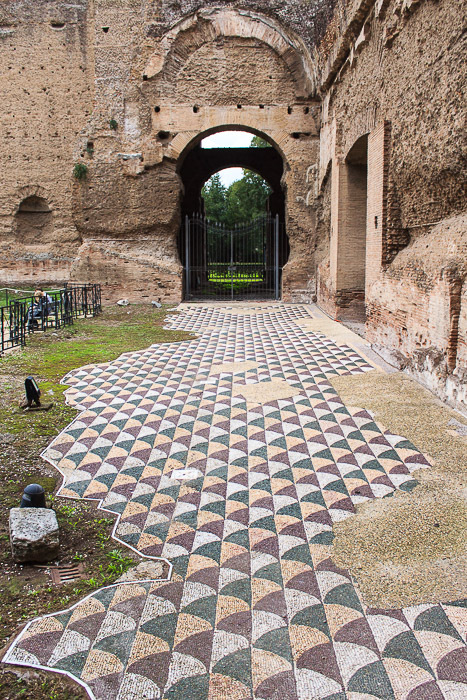 The central area of the frigidarium was an open space with a marble floor and decorative pools, fountains, and statuary. 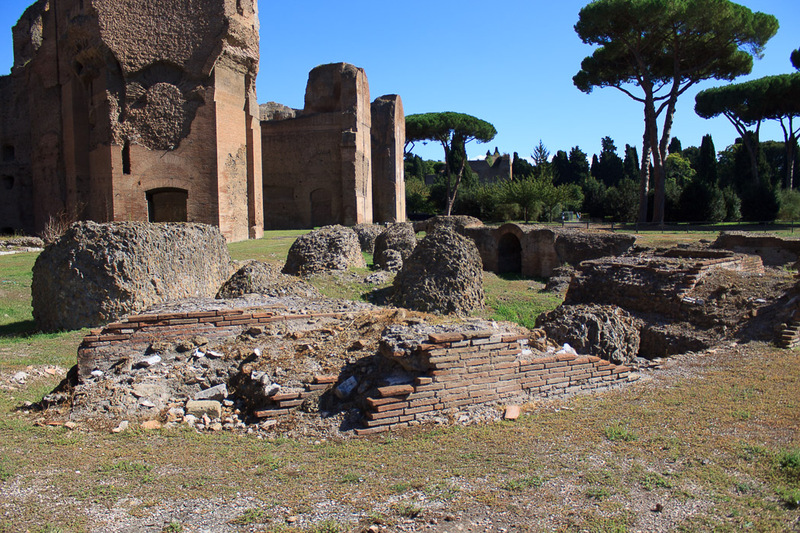 Primarily, the frigidarium served as a central meeting point for the visitors to the baths who would then go to one room or another of the thermal complex. But along the edges of the fridigarium were several very cold baths fed directly from the aqueduct, connected to the warm baths to the south and the cold natatio to the north by waterfalls. 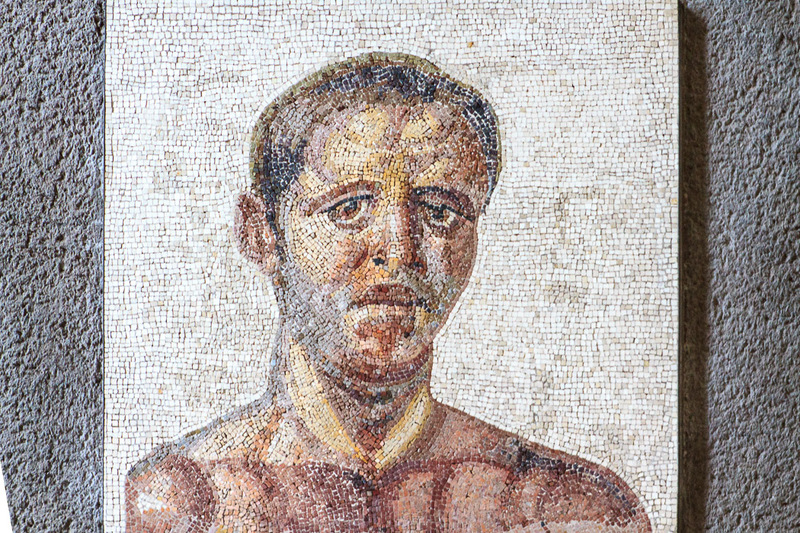 The Romans believed it was very healthy to have your pores opened up by the very cold water after bathing in the hot water. 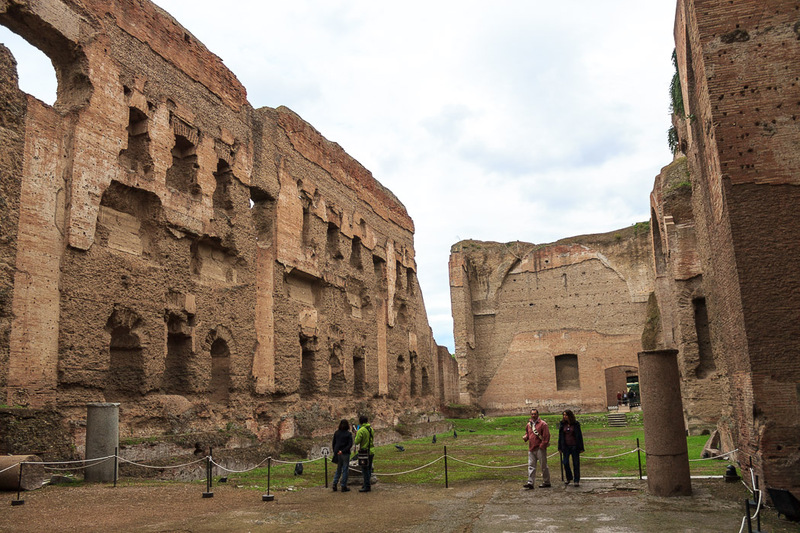 I think you can tell from some of these photos just how huge of a space the frigidarium was/is, but you certainly can't see the opulence because it was stripped away long ago. But you can get a taste of the grandeur of the room during ancient times by looking at the frigidarium of the nearby equally-sized Baths of Diocletian, which was restored as a church during the 1800s and is shown in the 8th photo below. 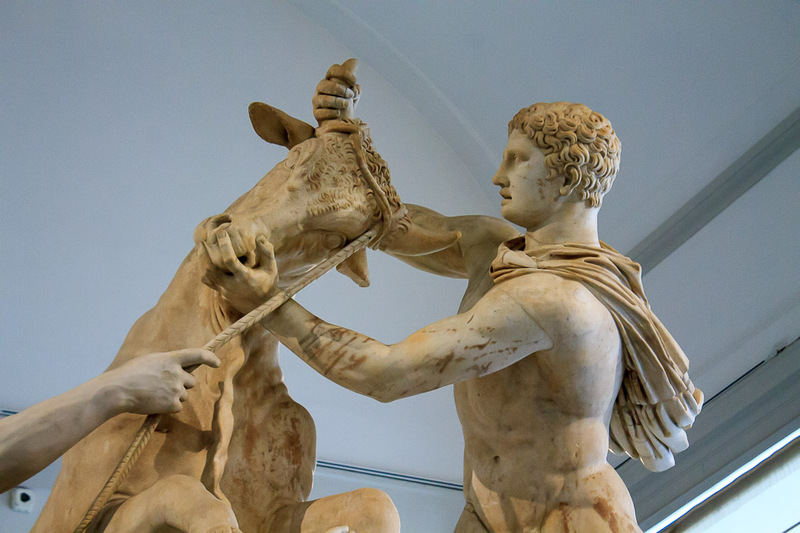 The decorations in the Baths of Caracalla during ancient times included statues of athletes instead of altars, but the elaborate marble floors, walls and columns might have been similar. 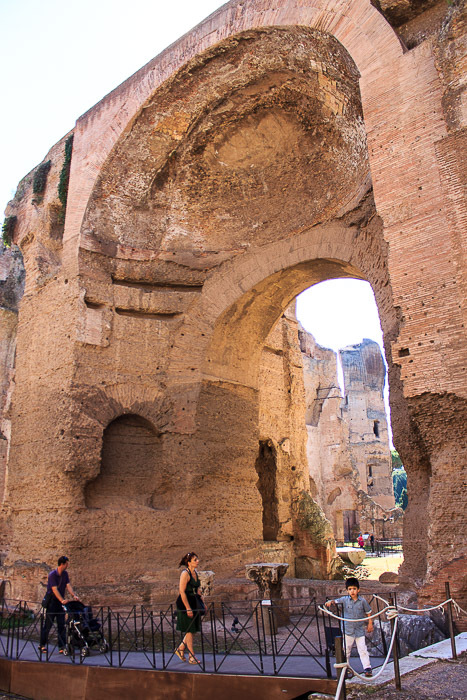 The frigidarium of the Baths of Caracalla was a monumental hall similar to a Basilica. 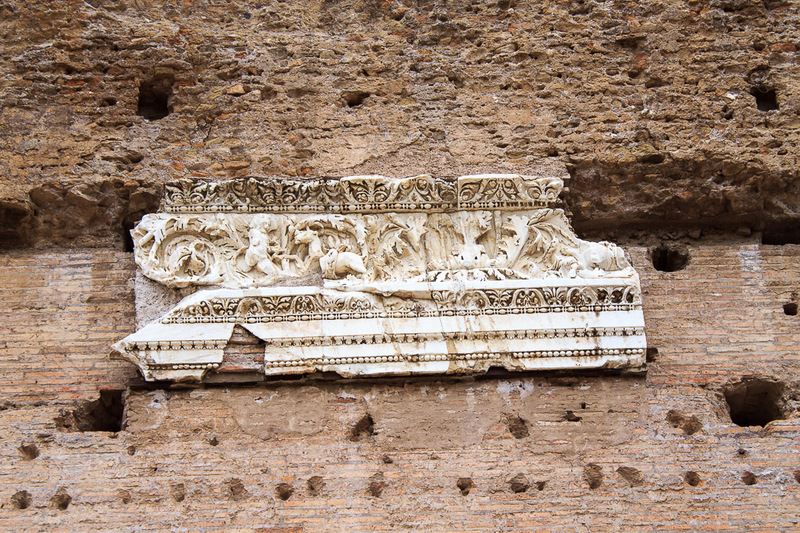 It inspired the frigidarium in the Baths of Diocletian, the Basilica of Maxentius, and the Chicago Railroad Station and New York's Pennsylvania Station. 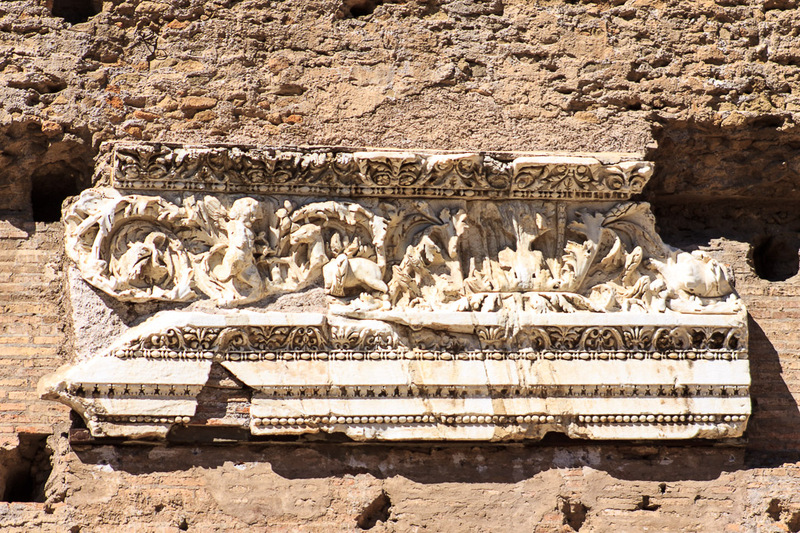 See all Baths of Diocletian photos. 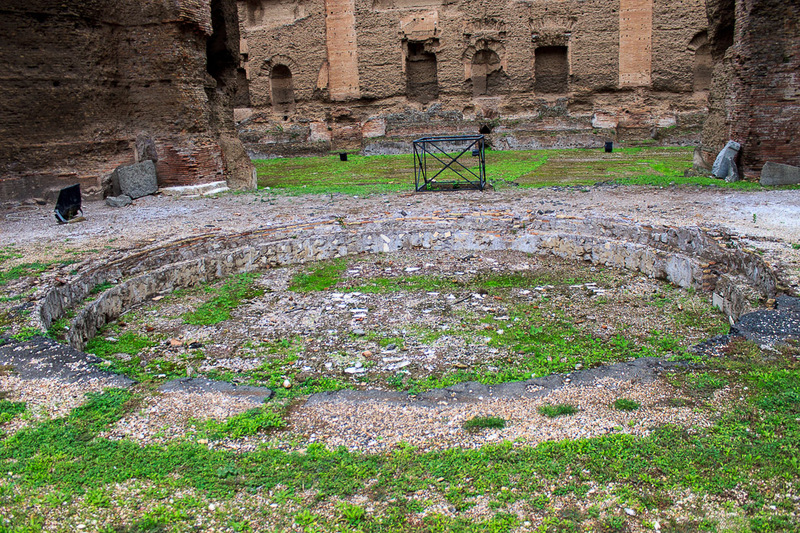 After some time in the frigidarium, you might take a swim in the natatio, or piscina, an open air olympic-sized swimming pool with large bronze mirrors mounted overhead to redirect sunlight into the pool. 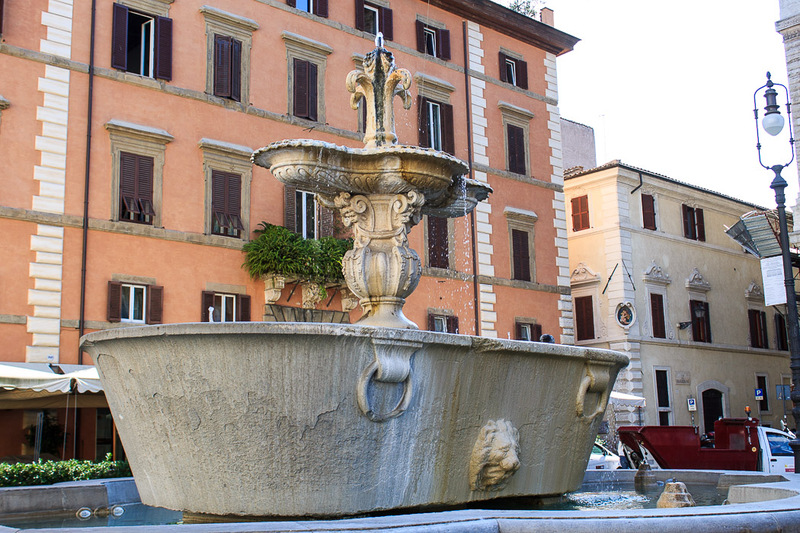 I can vouch for the fact that Rome can get very very hot, and I'm not surprised that a very large and cool swimming pool was a popular means of recreation. 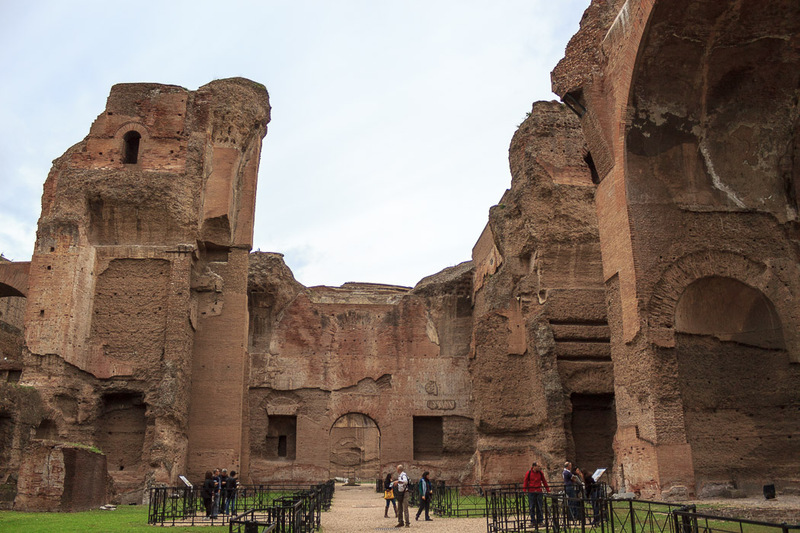 The frigidarium and natatio are both very large spaces; we'd have to assume they were built in those proportions to match the demand of the various amenities offered at the baths. A view of the natatio from the west is shown in the 1st photo below. In it you can see a thin white line just behind the short column on the right, to the right of the two people. That line is the marble edge of the pool, and is shown in close-up in the 2nd photo below. 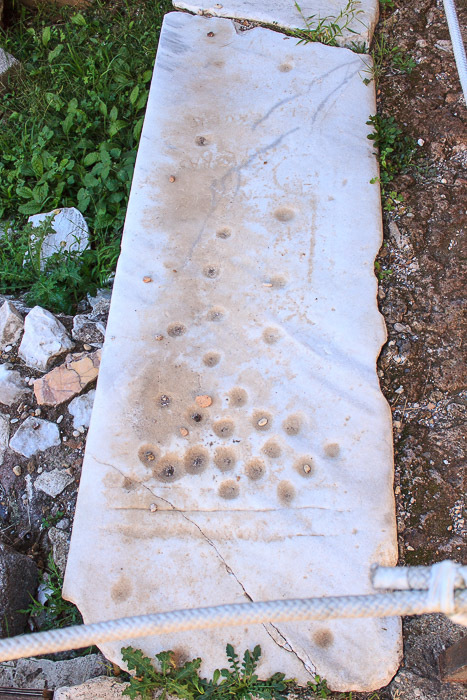 The holes carved into that marble edge were the board of some kind of game played at the edge of the pool with stones or marbles. It's shown better, albeit at an odd angle, after an apparent cleaning in the 3rd photo below. The 4th photo below shows the natatio from the east. Notice all the niches in the back wall that are easily visible in the 1st and 4th photos below; those once held statues. The 5th photo shows the best view of that back wall, and shows some of the plumbing in the lower niches which fed waterfalls that fed into the pool. The wall opposite that back wall has three huge alcoves, as shown in the diagram near the top of this page. One of those alcoves is shown in the 6th photo below, along with people to let you gauge its size. 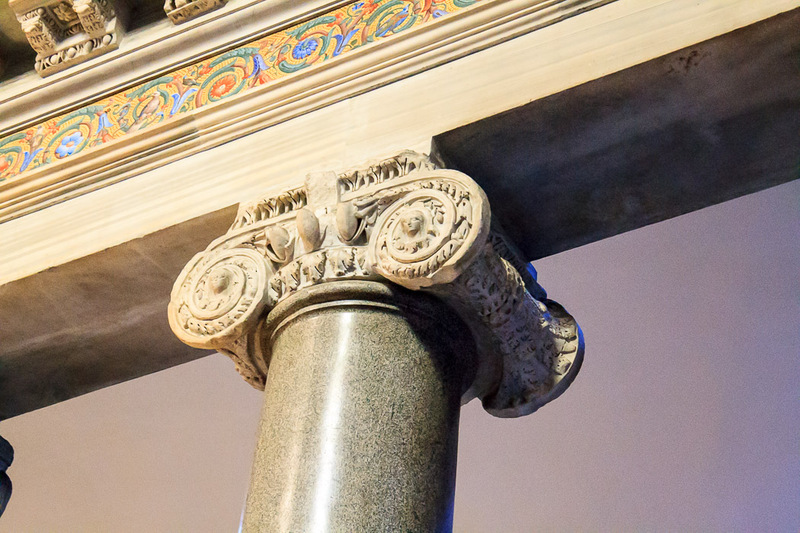 The 7th photo is a closeup of the fancy Corinthian capitals on display in that alcove. That photo also shows the edge of the pool. The pool was not very deep, and was inappropriate for diving, but I suspect it was a bit deeper than what has been excavated. The baths could accommodate more than 1,600 people at a time and welcomed between 6,000 and 8,000 visitors each day. The entire bath building was on a raised platform 20 feet high divided into two levels. The lower level was used for water drainage, and the upper level was used for heating the water in rooms using large coal and wood fires attended to by slaves. 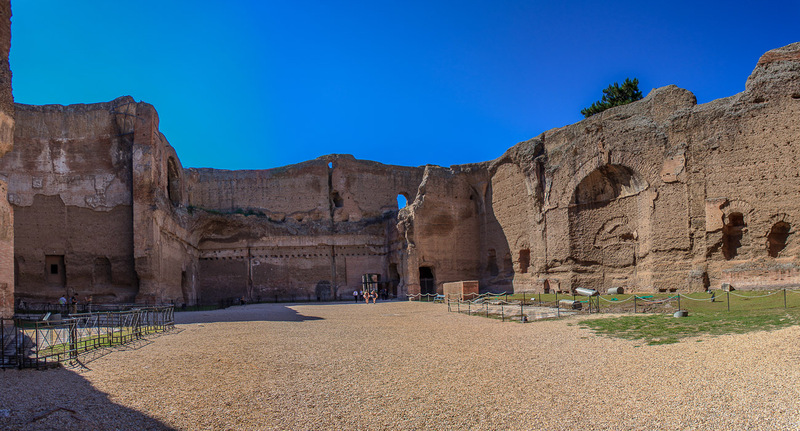 Additionally, the Baths of Caracalla were a complete leisure center, featuring two public libraries, one with Latin texts, one with Greek texts, shops, two palastre (gyms, or exercise rooms), gardens, art galleries, restaurants and even brothels. Here was a place where you could pass perhaps a whole day without even getting wet. It was more than simply a place to get clean. 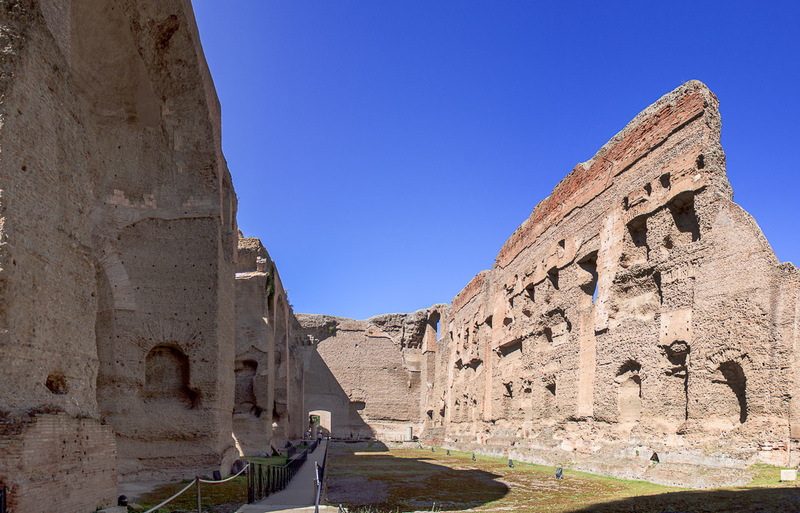 These baths were the model for the Baths of Diocletian, constructed 86 years later. 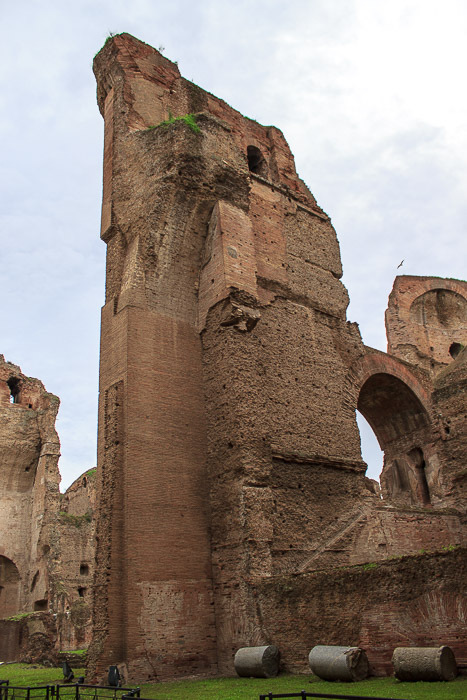 They were restored by Aurelian after a fire; he ruled from 270-275 AD, and again by Diocletian, 284-305 AD. Constantine (306-337 AD) modified the caldarium with the insertion of a semi-circular apse, leaving evidence of his work in an inscription preserved in the underground level of the complex. The baths were fully functional until 537 AD when the Ostrogoths, led by their king Vitige, destroyed the Aqua Marcia aqueduct, which was the water supply for the baths. 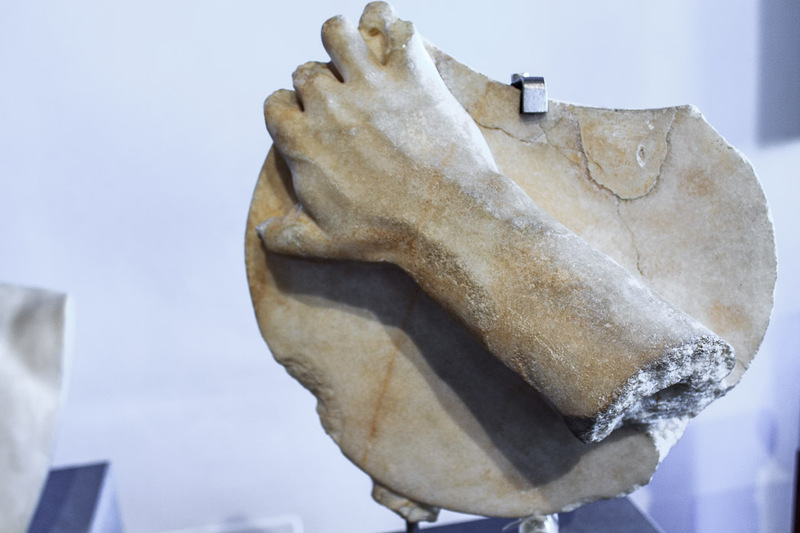 His intent was to cut-off the water supply to Rome, thereby bringing it to its knees. Subsequent negligence, looting, and an earthquake turned this great architectural complex into ruins. 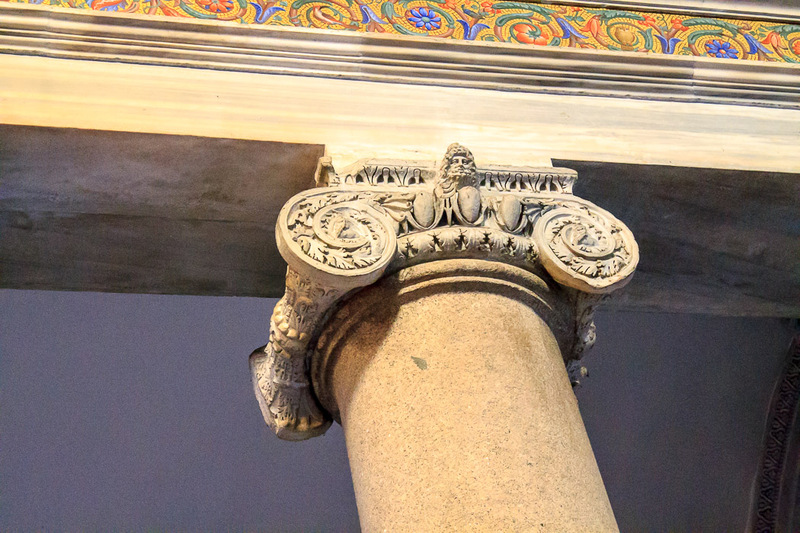 For example, 22 well-preserved columns from the ruins are found in the church of Santa Maria in Trastevere, taken there in the 12th century. 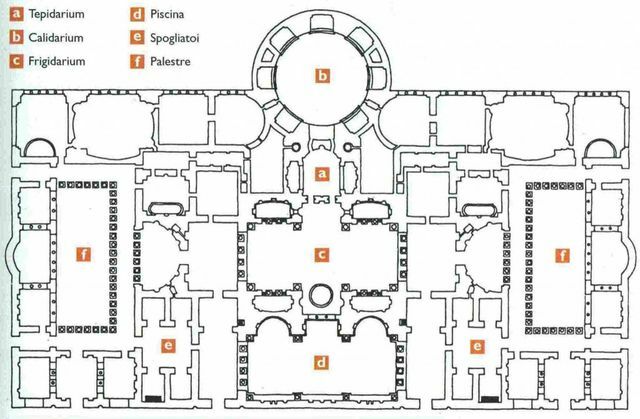 Pope Paul III Farnese stole much of the marble and statuary from the site to build his palazzo. But even though the remaining ruins have been stripped of their grandeur and beaten by the elements over the milienia, they continue to impress visitors thanks to their sheer size and magnificence. At the 1960 Summer Olympics, the venue hosted the gymnastics events. 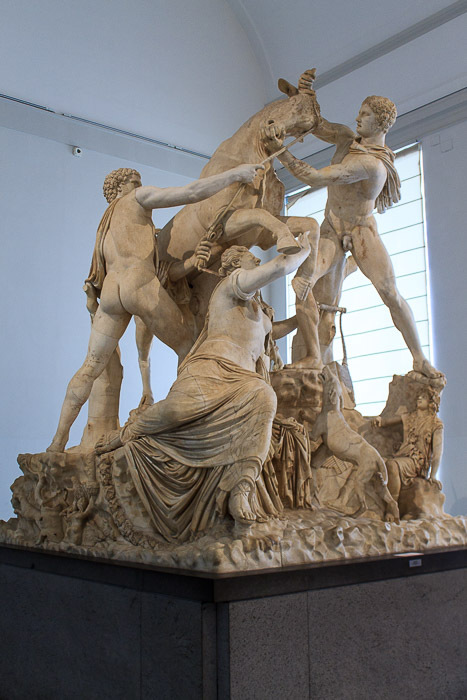 Today, in addition to being a popular tourist attraction, the central part of the bath complex is also a concert venue and is the summer home of the Rome Opera company. 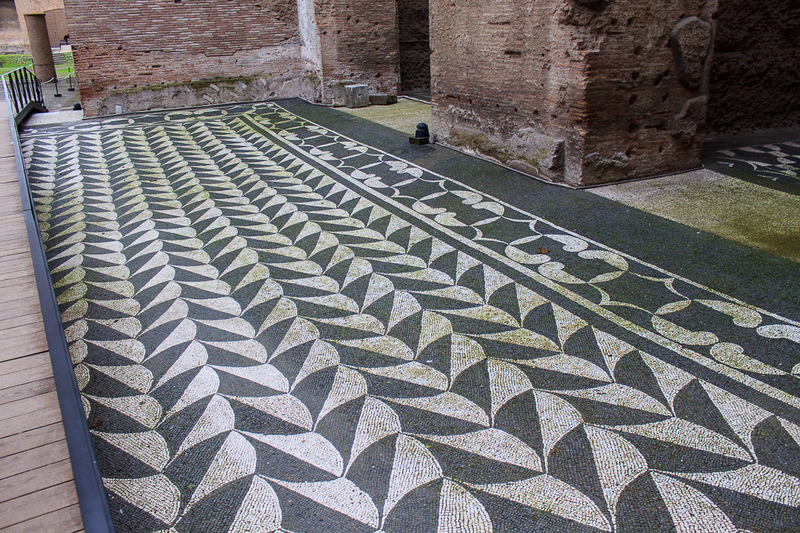 In addition to the mosaic floors shown above, there are several other decorations from the Baths of Caracalla that are on display on-site, as described in the captions to the photos below. 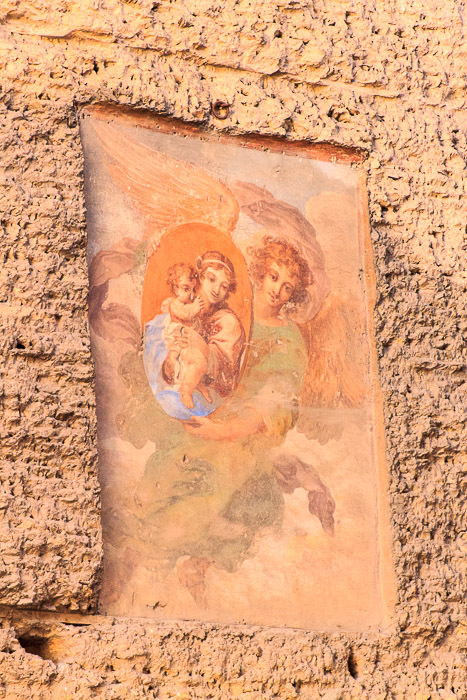 Many of the works of art from the Baths of Caracalla are now off-site in various churches or museums, as described in the captions to the photos below. 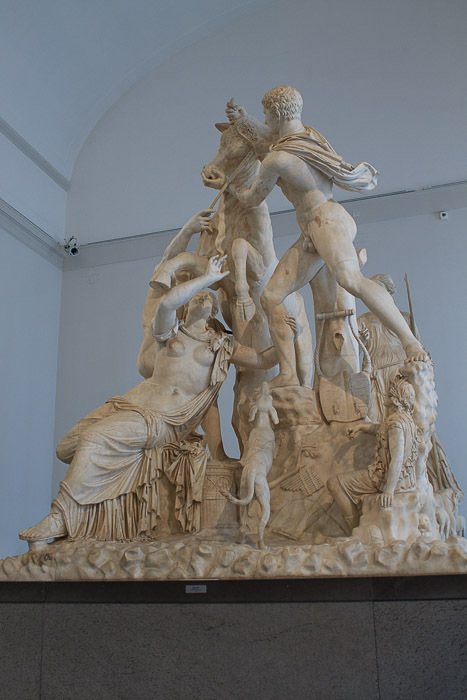 See all Naples Archaeological Museum photos. 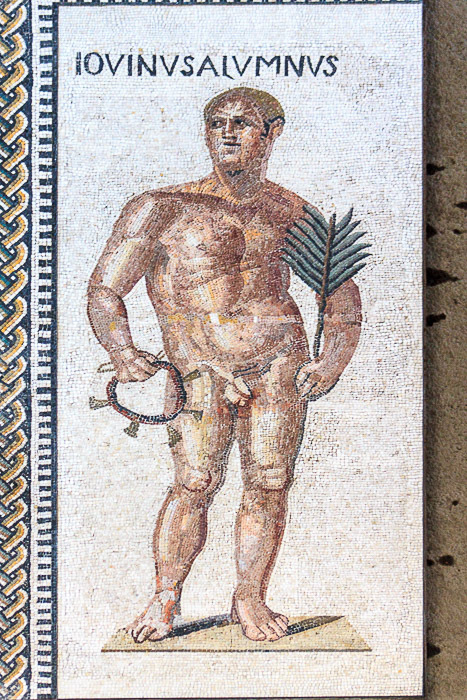 Heavily-restored mosaic from the floors of the public libraries in the exedrae on the east and west sides of the Baths of Caracalla, now in the (unfortunately, closed during my visit) Gregoriano Profano Museum of the Vatican Museum. They are divided into square panels with images of athletes. 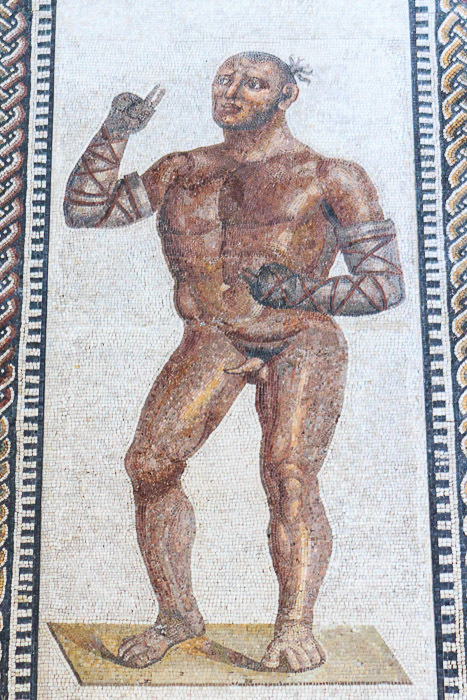 The vigorous musculature of their bodies and the powerful lines of their features are created by a rich combination of colored tesserae. 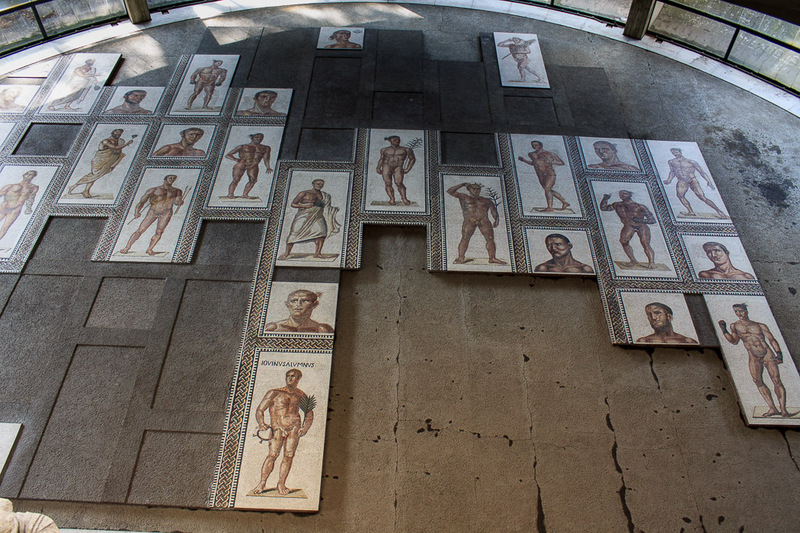 Although the baths were built at the beginning of the 3rd century AD, these mosaics probably date from restoration work undertaken at the beginning of the 4th century AD. See all Barracco Museum photos. 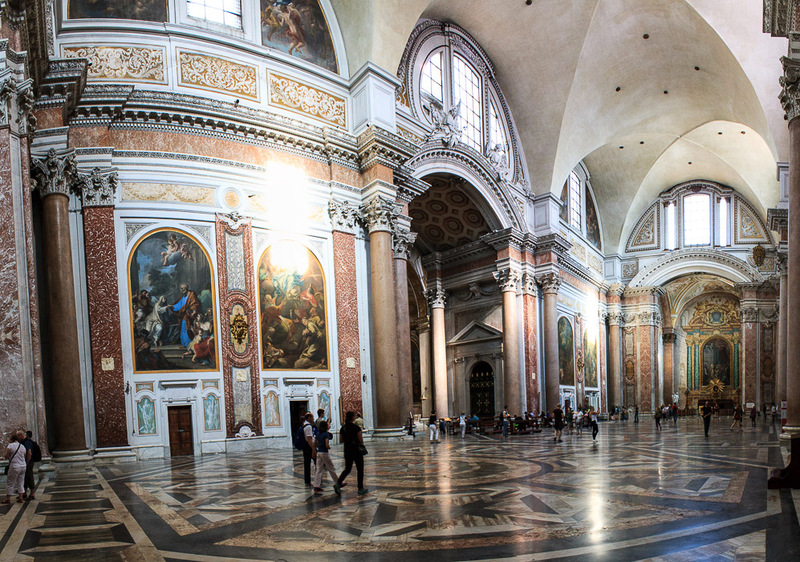 The nave of Santa Maria in Trastevere. 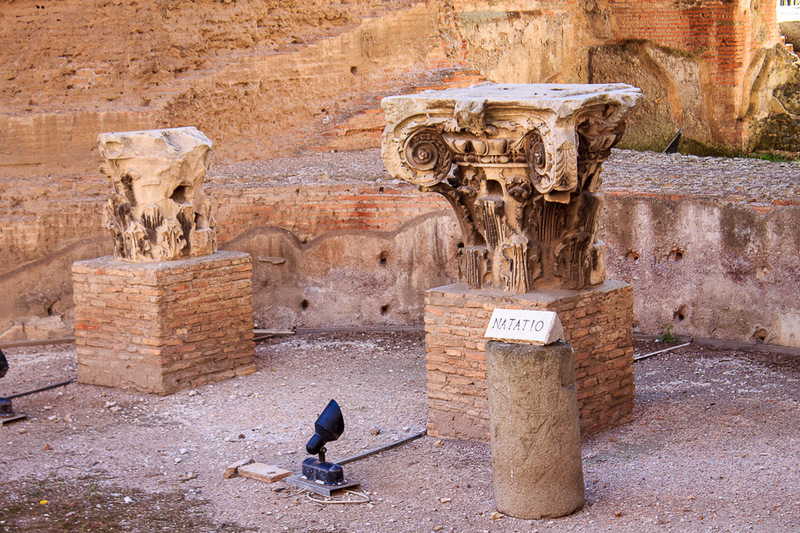 The 22 granite columns with Ionic and Corinthian capitals that separate the nave from the aisles came from the ruins of the Baths of Caracalla. 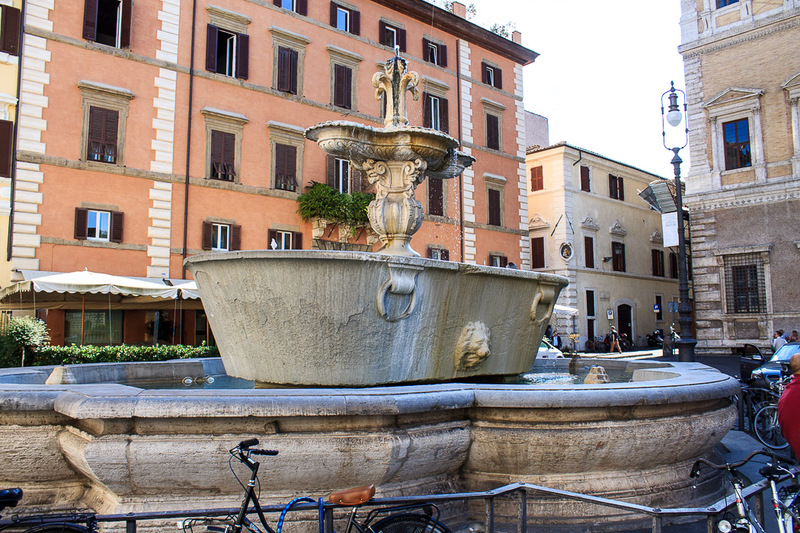 See all Santa Maria in Trastevere photos.